The Age’s shocking bias in favour of mass immigration and a ‘Big Australia’ has be laid bare by editor Alex Lavelle’s latest rant. Victorians might be concerned by news that the ALP government’s attempt to offset insufficient investment by successive state administrations is barely keeping up with current needs, let alone catching up with the backlog. The Age has long argued the best way to salve the growing pains is to invest more in infrastructure, rather than to slash population growth rates. In any case, with immigration a federal issue, there is little states can do to control how many people add to the population. 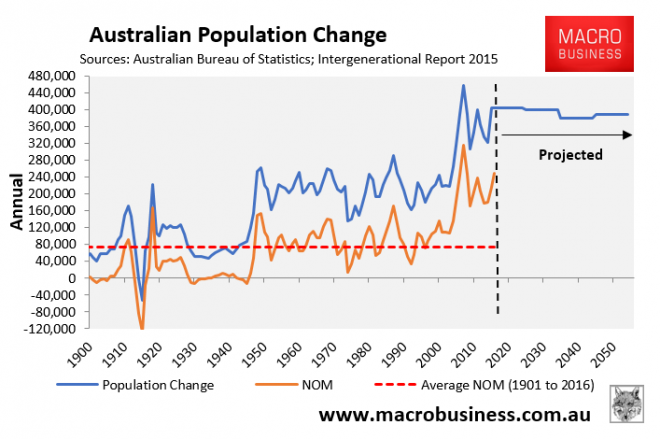 Studies in Australia and throughout the industrialised world show the benefits of population growth outweigh inconveniences of the like Melbourne is experiencing. What are these “studies” showing that the benefits of extreme population growth outweigh the costs? Because, the Productivity Commission’s various reports have certainly not shown net benefits to incumbent residents. 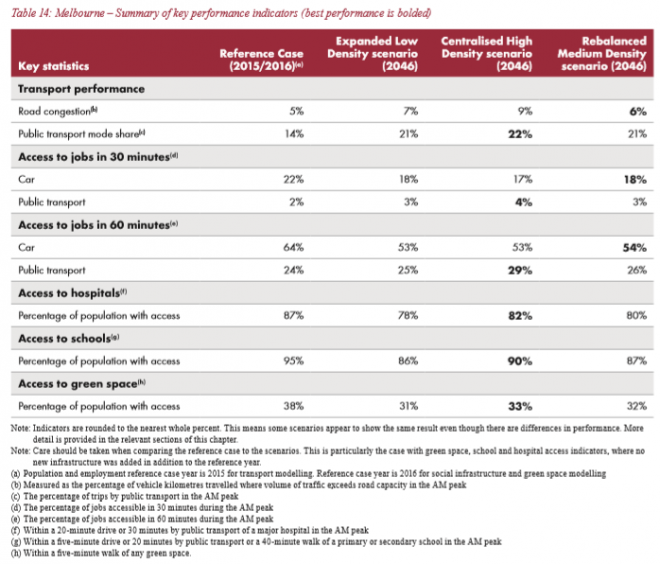 In any event, 15-years of empirical evidence in Melbourne has unambiguously shown that infrastructure, housing, schools and hospitals have all been crush-loaded – as explicitly acknowledged by The Age above. Why would The Age wish this future upon its readership, rather than taking the logical path of lobbying the federal government to reduce immigration back to sensible historical levels (see next chart)? The only genuine solution to protecting Melbourne’s amenity is to lower immigration and prevent the city from transforming into an Asian-style mega-city. The Age’s editor needs to stop representing the wealthy rentier owners of capital and stand-up for ordinary Melbournians. At the rate Domainfax is shedding staff dedicated to objective coverage, that may cost him his job of course. The New Daily, run by former Age editor Bruce Guthrie until he stepped down as editorial director earlier this year, saw its revenues collapse from $1.1 million in the last financial year to just $179,000 this year. The website, which began operating in 2013, is entirely owned by Industry Super Holdings, which in turn is controlled by superannuation funds including AustralianSuper, Cbus, Hostplus and HESTA. Domainfax will also suffer a collapse in revenue. Mainstream media is paid for propaganda these days. None of it is profitable. This why there are moves afoot to ‘regulate’ the news that punters see on the interweb. Alternative media sources have decimated the readership of mainstream organs and the authorities have lost control of the means to effectively disseminate propaganda (pardon me, ‘control the narrative’). It used to be the case that a Newspaper was constructed along the basic lines of: 1) reporting facts – these were split into focus areas in order of priority, 2) an editorial where the Newspaper opined on the key event of the day, 3) an Op-Ed page were some experts got to write their views and; 4 letters where people could engage. Today it seems that newspapers have blurred the lines so everything is now essentially an Op-Ed. Then these newspapers wonder why people rant about Fake News and why punters don’t read them anymore…. I can’t recakk the last time I bought a newspaper. 2001? people stopped reading them before the change you complain of, and are largely responsible for it. Opinion pieces are simply far cheaper to produce, and suit the funders of the paper more anyway. 6. Rehased press releases – 60% of articles are this in IT and business sections. Full time journalists have been replaced by casual bloggers. The concept of an independent, fact based “fourth estate” is dead. Now its all about clickbait headlines and stories with the potential to outrage a significant proportion of the public, so that it will get distributed by Facebook (thanks to their new algorithm that rewards posts with lots of comments). I read somewhere that a US news site wanted to stop publishing Trump stories and focus on actual news, but when they tried their traffic (and hence revenues) dropped. So its our own fault – we get more of what we click on and read, and we all have base natures. I wish people would stop representing the option as “for immigration” or “against immigration”, with “for” being “mass”….it’s a false, unspoken binary. Also, yes, we need infrastructure to keep up with immigration growth – but, at the current rates, we can’t keep up, and we don’t have the money (and less so as the housing bubble unwinds!). The infrastructure to be built is paid for by taxation on the current occupants. Over 37,000 it is rapacious, especially taking into account an additional gst. High house prices make it very difficult to get a start and start a family. Not so for the person who comes here with capital or the seasoned worker who comes here with experience. But the states could do things to make immigrants very uncomfortable if they wished to. They can’t effect immigration into Australia, but they could effect the state by state distribution if they wanted to. The fact they aren’t even attempting to clearly demonstrates tacit agreement with the federal policy and a desire for immigration. The state and regional distribution is an over-valued A$ question. It’s been going on for 60 years so I don’t know how it can be fixed, now, without major dislocation. The answers lie back in time. Not true, the states have the power to differentiate through taxes, charges, fees and rules and could quite easily create rules that direct immigration away from their state if desired provided the will to enforce existed. A non resident renters tax of 50,000 a year would be devastatingly effective at moving all non residents out of the state if this was the goal. Of course you are correct that a major dislocation is the result, I’m just sick of everyone saying it’s a federal issue the states can’t do anything about, when clearly they don’t want to do anything about it either. If they cared about “improving infrastructure” they wouldn’t build hundreds of high rise apartments on already heavily congested roads. That’s not improving infrastructure, it’s destroying what little there is. Any intelligent person can see they should be only allowing development on the outskirts of the cities. The truth is they don’t give a damn about what the 90% think. They’ll keep the floodgates open for as long as they can. “Improving infrastructure” is just an empty mantra they keep repeating to shut everyone up for as long as they can. I would love if they built a mega high-rise suburb along the foot hills of the Blue Mountains between Penrith and Richmond. It’s currently 100% useless space. I’m talking 500m+ skyscrapers for 500k+ people that would have amazing views across the Nepean River and Penrith Lakes to the city as well as up through the valleys of the Blue Mountains. Then build subways and motorways to connect to other mega suburbs, maybe even to a sister suburb on the other side of the mountains around Lithgow. And some suburbs in those useless valleys in between. That’s proper visionary and not soft c0k anti-vibrancy. I wouldn’t live there personally but with a few yum chas, curry shops and pet stores you’ll attract a lot of vibrancy. Instead we get you whingers. Love you telling it like it is. As good as Micallef f$/*in nails it segment. A mega suburb out near Richmond can’t provide the gardeners, nannies and other assorted cheap labour the north shore and eastern suburbs need, including the entertainment for the relations parties. The accommodation needs to be closer. It’s impossible to improve infrastructure in the big cities, especially transport infrastructure, if the population is increasing this rapidly, with most people moving into the established suburbs. The arterial road system in Melb/Syd was never designed to carry the traffic is currently is. Increasing the density of already built out areas with minimal capacity to widen roads and add tunnels (etc.) is a recipe for congested chaos. Which is what we now have. Adding more people only makes it worse. The urban planning disasters of the last 50 years continue unabated in the new greenfield suburbs that have continue to be rolled out to this day. Roads that are too few, far too narrow, poorly placed and connected to suburbs closer in. Our planners only look 5-7 years ahead and ignore the transport demands of 30-40 years time. Behind all of this are the banks…. Yep and behind the bank are a bunch of frightened economists busy writing nonsense on the economy. Good on them for defending vibrancy! Studies show that if conjecture is prefaced with the phrase studies show or similar derivative, prima facie said conjecture is 81.72947362% more likely to be believed. You’re not against studies are you?